Since the moment we moved to the block in March of 2012 our neighbors have made us feel as if we were life-long residents. Many of whom have been living on the block much longer than my lifetime. They easily could have written us off as young disruptors. With 4 kids under the age of 5 running around like a pack of wolves, I can only imagine the conclusions which might enter someone’s head. Instead we have been treated like family. Daily greetings, tips on living in a town we were largely unfamiliar with, help with the yard, help with the kids. I never thought I’d enjoy a conversation about the weather until I met these folks. Plus, they absolutely adore the boys with a genuineness that can’t be faked. It’s been a very humbling experience. As a kid, we had a neighbor for a few years who was the exact opposite. If a ball went over the fence, he kept it. If we stepped on his lawn, my dad heard about it. Thankfully, he moved away after a few years. I’d like to think my brothers and I drove him to it. So, I’m kind of the authority now on both ends of the spectrum. I’ve been shown how important it can be to welcome in that new family/couple/dude/lady who moves in next store. Looking back, it seems odd to me that getting so welcomed at first felt, well, odd and foreign. So let’s get back to it. Do your part and welcome your neighbors, young or old. Have them over for a bbq or to share a pizza. We decided to and it made for one excellent night! p.s. 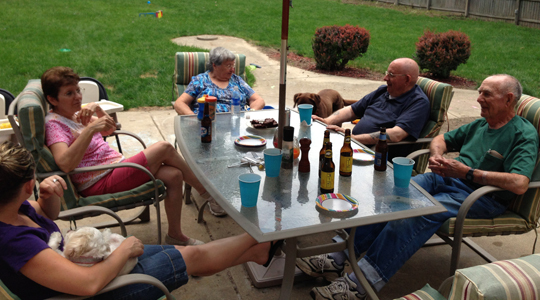 Last Friday, neighbor Bob (second one in on the right), he surprised us completely out of the blue with a pizza. It was from a place he had been telling us about. He “just wanted to see if we would like it”. How amazingly awesome is that?! Nicely written. All your neighbors seem so nice. We live in a day where people can go for years and not even know their neighbors names.